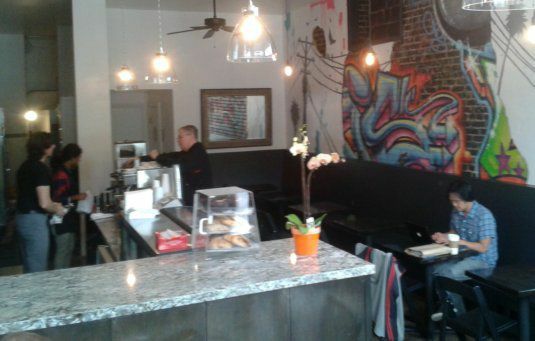 Echo Park’s landmark Chango Coffee reopened this morning after a week-long makeover. The menu and coffee remain the same as do the the employees behind the counter. But that counter is now a gleaming slab of granite that tops dark wood cabinets. The same dark paint covers a new longer, wooden banquette that runs underneath a new wall mural and bright white walls. Outside, a new mural by the same artist is also taking shape. The more refined look is the work of new owners Jenna Turner of Susina Bakery & Cafe and Marc Gallucci of Fix Coffee in Elysian Heights. 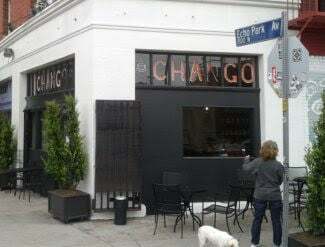 Chango customers made it clear they did not want things to change too much and Gallucci and Turner said they agreed not to replicate Fix, a Bauhaus-like cube staffed by uniformed barristas that stood in sharp contrast to Chango’s disheveled style. Instead, Gallucci said he wanted to give Echo Park residents cafe alternatives.